My sister Dedra "Dee" Montgomery is currently suffering due to lung failure. 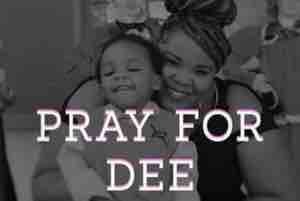 Dee is 26 years old, single mother of two, and is currently in the Intensive Care Unit in critical condtion. We were just informed she will be undergoing an ECMO procedure. "Extracorporeal membrane oxygenation (ECMO) is a temporary mechanical support system used to aid heart and lung function in patients with severe respiratory or cardiac failure. ECMO is conducted through the use of a special machine that pumps and oxygenates blood, ECMO provides continuous support of the lungs until individuals can breathe on their own. This is accomplished by the use of cannulae placed in large blood vessels that draw blood into the pump and through an oxygenation chamber that removes carbon dioxide, adds oxygen, and returns the blood to the patient." This type of procedure is not a simple procedure and will take time to do. This is the last thing they are going to attempt to get her well. This is Dee's last chance at life. Our family is asking for your help. In the event that it does take longer than anticiapated for her to heal, we will need financial assistance. Given Dee survives this procedure, it will be a long recovery until she is able to get back on her feet and take care of her little boys on her own. "God has a reason for allowing things to happen. We may never understand his wisdom, but we simply have to trust his will." Dee is being released in the morning! TO GOD BE THE GLORY !!!!! My God, My God! Dee is no longer in Intensive Care... They've moved her to a regular room. The Physicians and entire medical team have truly done a phenomenal job. Thank you Lord for using them. God did this! My sister is breathing on her own and is talking y'all! My God.. My God. We have truly witnessed God's everlasting love he has over all of our lives. Please continue to like and share and give what your heart feel is necessary. Thank you all so much for the donations this far and genuine concern for Dee. The recovery process has officially began. To God be the Glory! We owe him all the praise!!! --I'm anticipating seeing my sister today. For the first time in 12 days, she will know that I'm there. Dee and I are very close in age and were inseparable growing up. It was not very often you did not see one without seeing the other. :) Now-a-days we're too busy being "grown" that we forget how special genuine concern for one another truly matters. I'm sad that it took something so detrimental to her health for me to realize how much she truly matters to me. This time around will be better. This time around I'm holding on ..and I refuse to let go. Everybody needs somebody. ..and the person I need is her. I need Dee to get well. This is not only a second chance at life for Dee, but for all of us. Call the people you hold dearest to your heart and tell them you love them... Tell them now. It's important to stay connected. God will forever and always have the last say so. Thank you Lord for being a way maker! You always seem to make a way out of no way ... The procedure worked.. After 10 days of sedation, my sister is now awake! To God be the Glory !!!! Pray she has a speedy recovery...her boys need her! Thank You Jesus for giving my sister a Second chance At Life!!! Can I get an Amen !!?? Praying for a full recovery in Jesus name!! God bless you! !